“The beauty of holiness” is a familiar phrase to most Episcopalians (see Psalms 29, 96, 110, 1 Chronicles 16:29, 2 Chronicles 20:21). 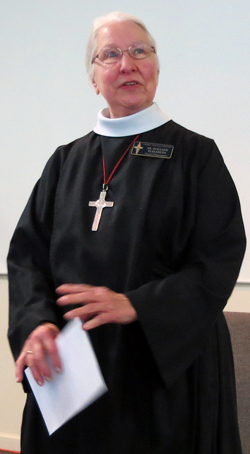 Keynote speaker, Sr. Suzanne Elizabeth from the Community of St. John Baptist in Mendham, NJ, led altar guild members in a two-day exploration into the meaning of these words and how they shape our lives. What is holiness? Something complete, something beyond, something “other,” something out of nothing. God the Creator is whole, complete, and needs no other. God created man in his own likeness, to worship and praise God. If we are doing what we are created to do, we will react in service to others. What is beauty? St. Thomas Aquinas tells us it is wholeness, harmony, radiance (illumination), and encompasses all our being — intellectual, physical, and spiritual. Without beauty, there is disharmony, imbalance, and darkness. Beauty is creative and is found in all of God’s creation, from the paw of the mouse to the depths of the Grand Canyon. Sister Suzanne challenged us to take time to dwell in the beauty of holiness. She stated “beauty creates calmness.” We need to grow in awareness of beauty around us and within us. We can heighten our awareness through icon reflection, flower arranging, being open to people, altar guild service, scripture, prayer, meditation, contemplation, intentional breathing, prayer beads, being outdoors. 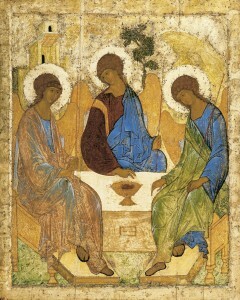 We used Andrei Rublev’s icon “Trinity” as an entry into the beauty of holiness. 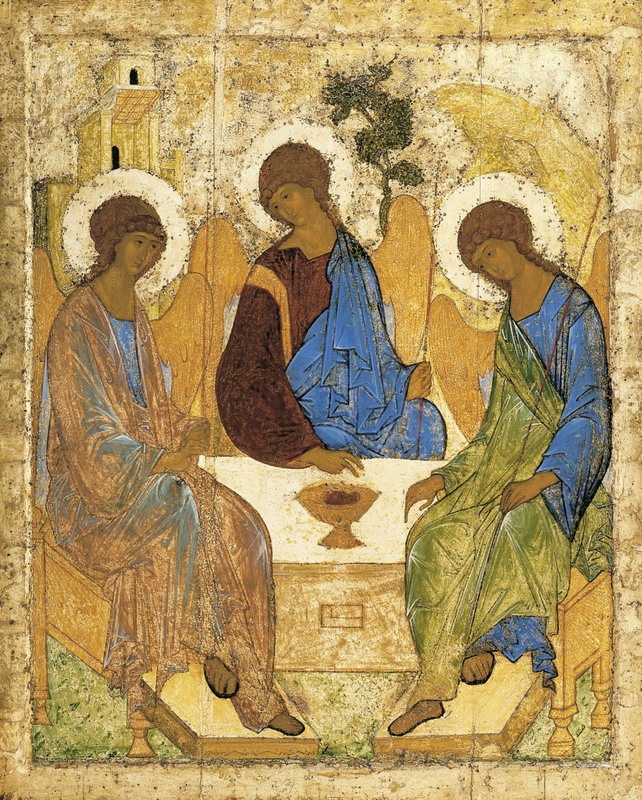 It is also known as “The Hospitality of Abraham,” but Rublev changed the composition to focus on the mystery of the Trinity — particularly fitting as it was the day after Trinity Sunday! The Father (left) displays earth colors, fitting for the Creator of all things. Both hands grasp the staff but the fingers of the right hand are raised in blessing. The Christ (center) wears a blue cloak for divinity, over a brown robe representing his humanity. His right hand rests on the table, with two fingers raised in blessing. The Holy Spirit (right) is clothed in blue and green, representing sky and leaves. The Spirit inclines toward Christ and touches the table, joining heaven and earth. Altar guild is a ministry, and its members should seek inward and spiritual grace. How do we find the light within ourselves? What gives us a sense of peace and harmony and lightness? When you feel you are not ministering but “doing a job,” please submit your resignation! How do we create order and beauty within ourselves? Seek to withdraw daily from the rush and news of the world. Be intentional and attentive in welcoming God into our lives. Pray, meditate, contemplate. Ask Jesus for healing and forgiveness. Allow the Holy Spirit to fill you with grace and energy. Prayer beads and prayer bracelets are a way to experience God. In every culture known, archaeologists have found some type of beads used for spiritual purposes. Seeds, nuts, stones, knots, bone, clay, shell, metal, glass — something about the roundness speaks of spirit. Sister Suzanne Elizabeth said people may be uncomfortable if she says “I’ll pray for you” — so she says “I’ll roll the beads for you.” Participants had the opportunity to make prayer bracelets, which were later blessed on the altar at the closing Eucharist. Being outside is another opportunity to experience the beauty of holiness. Be intentional — listen and look. Practice “intentional” breathing. Intentional breathing creates “spaces” so you can really see and really hear. Be still. Take a deep breath. Exhale slowly. Experience peace and order and stillness. Look for beauty and harmony in God’s creation. The second day of our exploration opened with the Prayer of the Chalice (following). Seek harmony, wholeness, illumination, order, and calmness. Sister Suzanne Elizabeth reminded us that God constantly cares about us. “I have engraved you on the palms of my hands” (Isaiah 49:16) and “you are precious … in my sight, and … I love you” (Isaiah 43:4). Each participant was given a hazelnut and a reading from the “Revelations of Divine Love” by Julian of Norwich. We held the hazelnuts and meditated on God’s love. Whether looking at the hazelnut or at ourselves, God made it; God loves it; God keeps it. Sister used the Lord’s Prayer to bring us out of meditation quietly and slowly. We experienced that particular type of energy found when praying with others. Our spirits need both service and quietness. Another path to the beauty of holiness is through prayer — contemplative prayer, prayer of silence, lectio divina. We do it all the time and just don’t realize it. As altar guild members, we are used to “doing for others” — but prayer is a way to care for ourselves. Sister introduced us to Praying in Color, a book by Sybil MacBeth, wife of an Episcopal priest. Don’t fall into the trap of judging your prayer — just pray. Focus down on the thing you are praying about. Draw a mental circle around a word or name, think of colors, let the Holy Spirit lead you. In prayer, be repetitive, plumb the depths, experience Celtic spirituality wherein the body and spirit are one and inseparable.